Long gone are the days when consumers were welcomed with toasters when they opened a checking or savings accounts at their local bank. Today’s consumers don’t want toast-making capabilities from their financial institution: they want cheaper, easy-to-use Internet- or smartphone-based financial products and services, including payment applications, lending platforms, financial management tools, and digital currencies, all with hyper-personalization. Most customers are quick to make a move if their current financial institution doesn’t deliver. So, what do banks need to do to retain their customers? Two things. First, they need to deliver the banking experience their customers are increasingly demanding. Second, they need to reconsider much of their service delivery location strategy. What do Bank Customers Want? Let’s first look at banking customers’ requirements for a SUPER banking experience. Few, if any, banks have the ability to deliver on these requirements. So, they’re increasingly partnering with financial technology start-ups – popularly known as FinTechs – to meet customers’ expectations. This brings us to the second thing that banks need to do to retain and grow their customer base: reconsider much of their service delivery location strategy. With innovation and personalization topping customers’ list of banking requirements, banks can no longer rely on the same location strategy they’ve used to deliver traditional functions such as applications, infrastructure management, and business processes. Why? Because FinTech requires a higher proportion of onshore/nearshore delivery compared to traditional functions and co-locating all FinTech segments such as payments, lending, and capital markets in the same region may be difficult given varying maturity of locations across segments. To help banks find locations for successful FinTech delivery, Everest Group developed a framework – presented in our recently published research report, “FinTech Services Delivery – Traditional Locations Strategies Are Not Fit For Purpose!” – to measure the innovation potential of a location. With the framework, banks can evaluate all aspects of innovation potential, including the availability of talent with emerging skills (such as artificial intelligence, machine learning, and analytics), adequate cost of delivery, and providers’ financial services industry domain knowledge. To develop our FinTech Services Delivery/Locations report, we started with a list of 40+ global cities with leading FinTech investment and market activity. Subsequently, we shortlisted 22 locations based on multiple criteria including overall investment, technology and infrastructure, and talent. Finally, we used our innovation potential framework, coupled with other factors such as maturity of the FinTech ecosystem and cost of operations, to determine the top locations banks should consider for specific FinTech use-cases such as payments, lending, and capital markets solutions. Locations that are currently regarded as nascent (e.g., West Africa, Southeast Asia, and Latin America) may emerge as attractive alternatives as the market evolves. 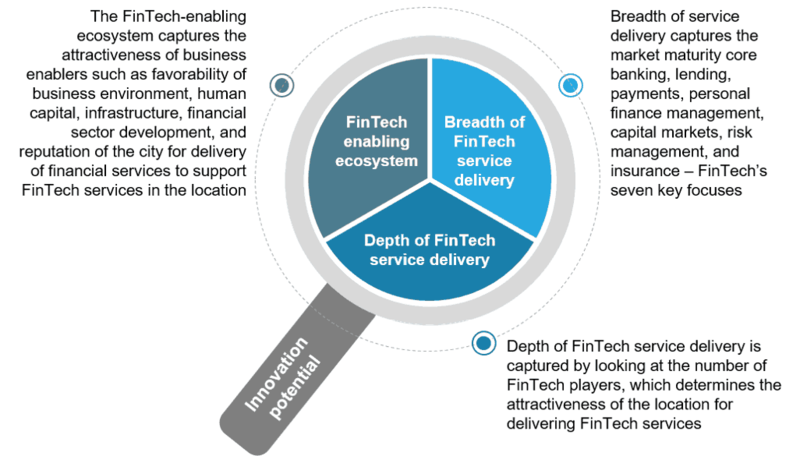 For more details, please see our report, “FinTech Services Delivery – Traditional Locations Strategies Are Not Fit For Purpose! Plus Profiles of Emerging Offshore/Nearshore FinTech Hubs” or contact Anurag Srivastava or Anish Agarwal directly. From a starting list of 128 leading RegTech startups, we identified trailblazers within seven key RegTech areas (data management and protection, fraud detection and investigation, identity and access management, KYC/AML, information security / cybersecurity, regulatory compliance management, and risk management) based on funding activity, the value proposition of the GRC solution, innovation in offerings and business model, and the use of emerging technologies to solve specific GRC challenges.